"Old photographs seem to collect dirt, scratches, and bad textures as they collect dust in shoeboxes and photo albums. If you’ve taken the task of scanning them, but have found damage and scratches, here’s how to fix them." 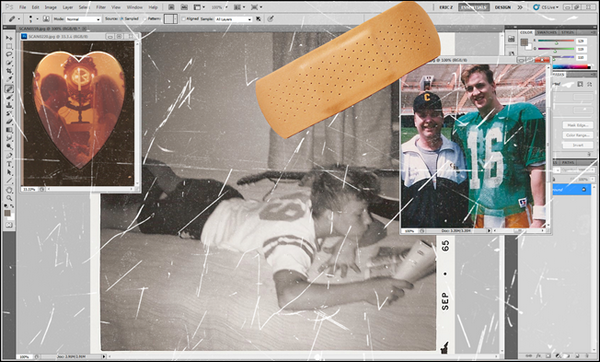 If you need to repair a few scanned photographs, here is a guide on how to do it. In addition to Photoshop, the guide also offers references to Paint.net and GIMP, which is useful for those who do not have Photoshop. However, if you have a lot more than a handful of photos to repair, I suggest looking for a flatbed scanner with Digital ICE technology. The extra time needed to scan with ICE will be a lot lot less than the time spent touching up, even if you have to make minor corrections to catch the damage ICE missed out after the scan.